One-third of African-American women suffer from traction alopecia – the most common form of hair loss among that group. Researchers with the Johns Hopkins School of Medicine in Baltimore have issued a warning to people who prefer hairstyles that put prolonged or repeated tension on the hair root. They hope to discourage hairstyles such as tight ponytails, braids, knots, dreadlocks, weaves, extensions and buns to prevent traction alopecia, gradual hair loss caused by damage to the hair follicle. Traction alopecia is the most common form of hair loss among African-American women. Traction alopecia is mechanical in etiology, rather than androgenic, which means that it is caused by environmental factors and is not genetic. At Arocha Hair Restoration, we have been writing about traction alopecia and its connection to tight hairstyles for many years. You can review the article, “Causes of Hair Loss Among African-American Women,” and watch a video featuring Dr. Bernard Arocha discussing the matter. As we have noted previously, these styles are popular among African-Americans. Tragically, the constant pulling of the hair, tight-locking patterns and added weight can result in traction alopecia. The latest research effort, published in the Journal of the American Academy of Dermatology, involved a detailed analysis of 19 previous studies and determined there is a strong association between scalp-pulling hairstyles and traction alopecia. Chemically straightening hair can result in breaking because it weakens the hair shaft. Extensions – especially when adhesive is applied directly to the scalp – can lead to hair loss. Use of heat to straighten hair, such as blow drying and the use of flat irons, could weaken hair, leading to thinning and balding as well, researchers stated. On the flip side, researchers determined that untreated and unprocessed hair can decrease the risk of traction alopecia, making it possible to withstand greater traction, pulling and brushing, regardless of styling. The lead researcher, Crystal Aguh, M.D., an assistant professor of dermatology at the Johns Hopkins University School of Medicine, stressed that traction alopecia is entirely preventable. 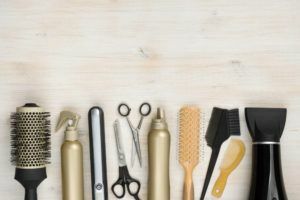 “Hair is a cornerstone of self-esteem and identity for many people but, ironically, some hair styles meant to improve our self-confidence actually lead to hair and scalp damage,” said Dr. Aguh in a Johns Hopkins news release. High-risk styles include braids, dreadlocks, weaves, and extensions, especially when applied to chemically straightened hair. Moderate-risk styles include some of the same styles noted above, but without the harmful chemicals. Low-risk styles generally included low-tension styles, such as wearing hair in a naturally relaxed state, or gathered together into loose buns. So what can you do? Proper evaluation with a hair loss expert is essential. A physical examination, dermoscopy, a lab evaluation and a scalp biopsy may be needed. If traction alopecia goes untreated, hair loss can become extensive, which can be devastating for many women. Also, we feature before/after photos of hair transplant results for a patient who experienced traction alopecia. Dr. Arocha performed transplanted 2,000 follicles to fill in the patient’s temporal peaks and hairline. 1. Alternate hairstyles to reduce or avoid the styles to put tension on the follicles. 2. If you have weaves and extensions, remove them after no more than six to eight weeks at a time. 3. If you have braids, loosen them after a maximum of two to three months. These simple steps can help the hair follicles to recover from stress and prevent traction alopecia.